The M113 is a fully tracked armored personnel carrier that was developed to provide an air-mobile, survivable and reliable light tracked vehicle able to be air-lifted, air-dropped, and parachuted by C-130 and C-141 transport planes. 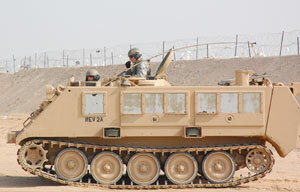 ISO Group provides spare parts and solutions for several versions of the M113; the M113A1, M113A2, and M113A3. ISO Group has experience in the M113 Engine Assemblies, Drivetrain, Transmission, Track Shoe, Electrical Assemblies, Weapons System, and Accessories.